Many of us were raised on human-centered design. Our practice is firmly rooted in methods such as personas and journey maps that help us get an understanding of who we’re designing for. HCD gave us a framework to tame complexity by putting humans at the centre of problems and designing around their needs. It has been great at streamlining users’ everyday activities, like navigating a city (Google Maps), socializing (Snapchat, Facebook), and shopping (Amazon). It got us far. But the world has changed and it’s time for us to evolve beyond our roots. This is a critical time for us to examine the human context. We have access to more data about ourselves and the world than ever before, we have mobile supercomputers at our fingertips, and AI has firmly taken root in the products and services we interact with daily. Computers are becoming more than devices that optimize our life, or make us more efficient. They’re starting to augment us, giving us entirely new capabilities. They’re starting to work with us, not just for us. The trouble with human-centered design is that it’s too narrow a lens to examine a world like that. Believing in the potential of people is very different from making humans the only thing in the centre. Today, we need to design not just for humans, but for centaurs: human-machine hybrids built to do more than any person or computer could accomplish alone. In this talk, I’ll explain how, in this next iteration of design, we don’t have to incorporate all the elements of HCD. I’ll share examples of centaur products and lay out the new rules of design to optimize for them. Participants will leave with a new perspective and a set of principles for going beyond HCD into the world of Centaur Design. 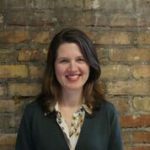 Lindsay Ellerby is the Senior Design Director at Normative, a software innovation firm in Toronto, where she leads the team on a wide range of projects that include research, interaction design, product innovation and strategy, and end-to-end design of software applications. Stemming from her fascination with cybernetics, she is passionate about designing for complex systems and working on unsolvable problems. Lindsay has worked in the field of design for 15 years helping teams execute for organizations including Cisco, SickKids, Xerox PARC and Citibank. In her spare time, she can be found chasing her kids around a Toronto park, trying to fit in a yoga class, or both at the same time!